Good afternoon, friends from the press! 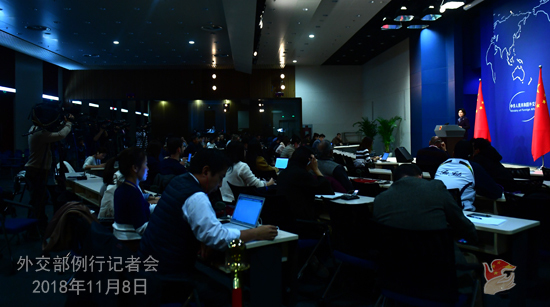 November 8 marks the Journalists' Day in China, I wish all Chinese and foreign journalists working and living in China a happy festival! 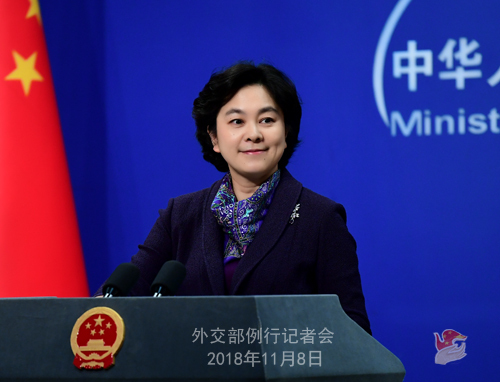 I would like to take this opportunity to thank you all for your long-standing support for and active participation in the foreign ministry's regular press conferences, and we look forward to continued good and close cooperation with you all! At the invitation of France, Vice Chairman of the NPC Standing Committee Ji Bingxuan will attend the Paris Peace Forum and related events on behalf of the Chinese side on November 11. At the invitation of State Councilor and Foreign Minister Wang Yi, Minister of Foreign Affairs Heiko Maas of the Federal Republic of Germany will pay an official visit to China from November 12 to 13, during which the two foreign ministers will hold the fourth China-Germany Diplomatic and Security Strategic Dialogue. Q: Could you give us more details on Vice Chairman of the NPC Standing Committee Ji Bingxuan's attendance at the Paris Peace Forum? A: The World War I is a grave disaster in the history of mankind that caused untold sufferings to all countries, including China. During the war, around 150,000 Chinese laborers have left their homeland and travelled to Europe. They have made important contributions to the restoration of peace and post-war reconstruction, of whom over 20,000 even laid down their lives there. The Chinese side attaches importance to and supports the hosting of the Paris Peace Forum in commemoration of the 100th anniversary of the end of the World War I. We hope that this event will help the international community review the lessons of history, cherish and uphold the hard-won peace and stay committed to resolving international disputes through dialogue and negotiation as well as multilateralism, strengthen and improve global governance, and safeguard lasting world peace. In Paris, Vice Chairman of the NPC Standing Committee Ji Bingxuan will attend the opening ceremony of the Paris Peace Forum and memorial services for Chinese laborers and meet with French political leaders. Q: According to reports, Foreign Secretary Teodoro Lopez Locsin of the Philippines recently said that China and ASEAN are pushing forward the relevant negotiations on COC with astonishing amity and that there may be differences and and disputes on the South China Sea in the future, but they need not stand in the way of the concerted efforts made by all relevant parties to conduct mutually beneficial cooperation in other areas. What is your comment? A: We have taken note of the positive statements made by Foreign Secretary Teodoro Lopez Locsin. Currently, thanks to the concerted efforts of China and ASEAN countries, including the Philippines, the situation in the South China Sea is stable on the whole. The relevant countries have come back to the right track of properly resolving differences through dialogue and consultation. The consultations on the text of the Code of Conduct in the South China Sea (COC) have witnessed continuous progress. Last month, a series of the South China Sea-related meetings including the third meeting of the China-Philippines Bilateral Consultation Mechanism on the South China Sea, the 16th Senior Officials' Meeting on the Implementation of the DOC and the 26th Joint Working Group Meeting on the Implementation of the DOC were held successfully. All relevant parties had a thorough exchange of views on managing differences, enhancing cooperation and the text of the COC. 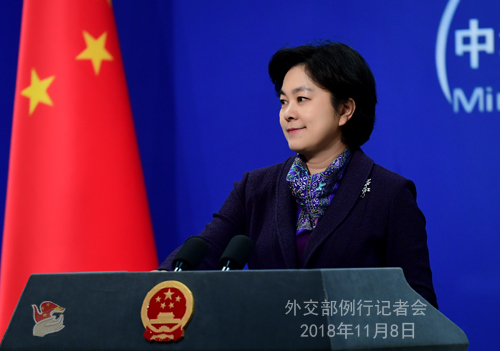 China appreciates the positive and constructive attitude the Philippines has showcased in the negotiations. At the end of last month, State Councilor and Foreign Minister Wang Yi visited the Philippines and had an in-depth and friendly exchange of views on stepping up maritime cooperation and upholding peace and stability in the South China Sea with Foreign Secretary Locsin and other Philippine leaders and reached many new important consensuses. The peace and stability in the South China Sea serves the common interests and meets the shared aspirations of the regional countries. It is also our shared responsibility to uphold peace and stability there. China will continue to work with the Philippines and other ASEAN countries to actively advance the COC consultations and maritime practical cooperation and consolidate the current sound momentum. Q: According to reports, the El Salvador President said on November 7 that China will give his country financial aids for social and technological projects. Can you confirm that? Doesn't this sound like the "dollar diplomacy" that Taiwan is always accusing the Chinese side of practicing when it tries to win over its "allies"? A: First of all I have to emphasize that China's support and assistance for El Salvador don't bear the slightest resemblance to the so-called "dollar diplomacy" as Taiwan alleged. On November 1, President Xi Jinping held talks with El Salvadoran President Salvador Sanchez Ceren in Beijing. We issued a detailed news release then. President Xi Jinping stressed that the establishment of diplomatic relations between China and El Salvador conforms to the historical trend and is in line with the fundamental and long-term interests of the two countries. China stands ready to work together with El Salvador to steadily and rapidly advance the friendly exchanges and cooperation between the two countries for the benefit of the two peoples. The Chinese side is willing to cooperate with the Salvadoran side in infrastructure and other fields under the principle of government offering guidance, enterprises as the main player, market operation, win-win results and mutual benefit, and support competent Chinese enterprises in investing in El Salvador. The Chinese side is willing to provide support to El Salvador in education, medical care, water supply, disaster prevention, etc. It is also willing to provide more scholarships to El Salvador, strengthen cooperation in human resources training, and list El Salvador as a destination for outbound Chinese tourist groups. The friendly exchanges and cooperation between China and El Salvador are rapidly progressing. As to reports you cited as saying that China will provide financial aids to El Salvador, I want to stress once again that China-El Salvador relations are based on political principles and aimed for common development. In the spirit of friendship between the two countries and South-South cooperation, China is willing to provide assistance for the economic and social development of El Salvador as its capacity allows. The assistance will focus on El Salvador's urgent livelihood needs, such as food and water supply equipment for disaster-stricken areas and learning devices for poor students so as to benefit the society and ordinary people in El Salvador.